Inside the working gears of my mind, there is a place that crafts together to-do lists miles long. Goals, chores, grocery lists....all carefully comprised and organized. These parts of me thrive off of knowing I have achieved something I set out to do. And with every one thing that I cross off my list, there is a sense of accomplishment that washes over me. My mother did, and still does the same thing. Every week she makes her cleaning lists, her lunches and dinners for the week. Vacations were always started with her long, and perfectly contrived list of items we needed. Whoever was left home was left with an equally impressive list of things to be taken care of around the house, down to what times the animals ate, and how much. I need this game, and I play it every day. Sometimes it feels like chains, bound tight around my throat. Only releasing if I feel that I have accomplished enough. And when I don't, and things are left undone, they weigh on my chest and closing breaths until I can hardly stand it. Elodie is 3 weeks old. And in those 3 weeks I have only taken 2 naps. Both involuntary, and a product of falling asleep in the middle of what I was doing. Elodie is 3 weeks old, and I still struggle to let go of these stupid lists to just hold her for half of my day. In three weeks I have gotten a lot of things done. Laundry is done every day, the house is vacuumed and trash is taken out. And at the end of the night I miss her. I want to scoop her up and feel her skin on me, her tiny rising chest and sweet smell surrounding me. In the same dark holes of my mind where I make my lists and hold my disappointments in myself, there is a place that reasons and argues over spoiling her with all of the love and time I have to give. In these places I realize how critical I can be of myself. All this doubt and fear and worry pools and collects until it forms a hot coal of failure. Failure in knowing that no matter how hard I try to do this all right and perfect, things will always go wrong. No doubt because I have turned to my methods of analyzing everything to death - instead of just doing what feels right. Elodie is 3 weeks old. Each day she teaches me something about myself, a voice louder than one I have heard before. Her voice drowns the disappointment, it drowns the lists, and it drowns my doubt in myself. A tiny voice, sometimes it comes out only in a drawn-out, breathy, "haaaaa" that trails into a sweet yawn that melts my heart into an open sea. I have 3 more weeks home with her. These will be the only first weeks. Ones that I will remember in 30 years, when she is having babies of her own. Ones that I will cry and wish to have back, when I am drowning in my to-do lists, chains bound tight around my neck. If nothing changes, we will always stay the same. And sometimes that is the worst thing we can do for ourselves. Today, and tomorrow, and for the rest of my time as Elodie's Mother, a to-do list will never be more important than when she just needs me to lay with her, naked, warm, and vulnerable. I will learn to let go of my lists, and throw them to the bottom of a hole marked "To-Don't." I'm in loooove with your stories of your new baby girl! Love it! Inspires me, when I will someday have my own child. You make it so beautiful, it's very inspiring, thank you sooo much! Lots of love to you guys! mommies are never wrong. even when they are, they're not. i still marvel at my tiny running, talking, thinking, sleeping beast and melt with every smile and giggle. i hope to never outgrow this love. absolutely beautifully written. what wonderful perspective. i hope you are able to continue to enjoy your exclusive time with elodie. thank you for a wonderful post. 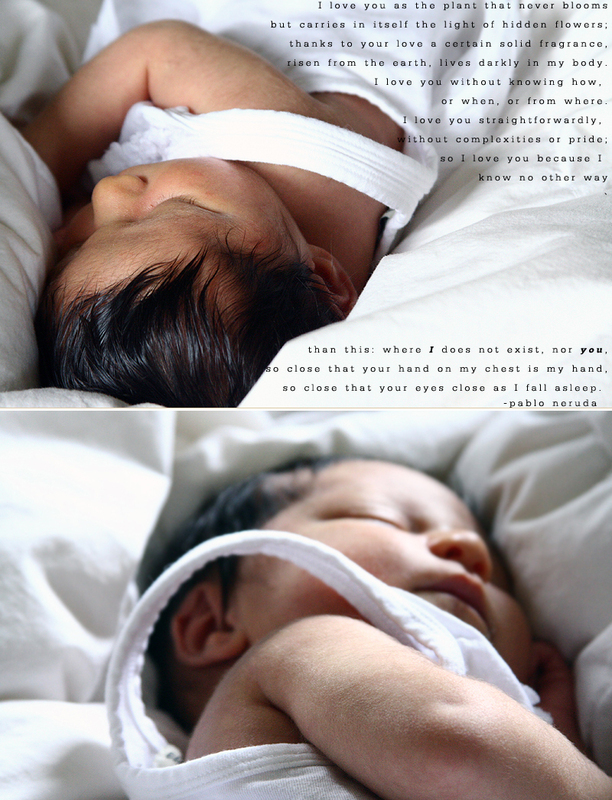 What a beautiful baby and well-written words. You make me excited to be a mother one day. so precious, beautiful, and inspiring. Reading about baby Elodie...makes me think about my own...3 and 5. Oh how I wish I could get that time back...to sit and hold them and to do nothing else. Enjoy the laziness of just being with her! oh myyyy aura, this was so beautifully written. raw and vulnerable and honest. these harried lives we all live--doing doing doing... when what is most important and the only thing we will remember is what we didn't do but the time spent loving and being quiet with ourselves (or our babies!). go you. Saying this post is beautifully written just doesn't do it justice. This post is honest, true and completely engaging. Thank you for your honesty and for sharing your pictures. Your little girl is so sweet. I hope you continue to enjoy every moment. You are the most gorgeous new mom and these photos are lovely. Treasure these few weeks because you'll never get them back again. Elodie looks healthy and beautiful - it's obvious you are doing her right. Love your pics! Your baby is so beautiful! Congratulations! Beautifully written Aura and these photos are gorgeous. This reminds me so much of myself. I am such a neat freak and I always felt like things HAD to be done at a certain time. I always made lists and if I didn't finish the tasks on them I felt disappointed and sad. I have slowly began to let go. Who cares if I haven't vacuumed or dusted in 4 days? If the laundry isn't done every few days or if we are having peanut butter and jelly for dinner. Taking care of P and spending my days with her are what is most important now. I try to focus all my energy on her when she is awake. I dont want to miss a thing. The pics of you and your baby girl are so beautiful. I love it. I loved this post... this is exactly my struggle. I come from a family of 'productive' people and it is so hard to fight that tendency. But I know it is right. These things matter... these things that can't be crossed of a list; they're repetitive and relational and human. This is what being a mom is all about. You are absolutely right! Challenge yourself to kiss, hold, and love on her ALL day long! She is your To-do list! I learned that lesson myself; I have a beautiful 15 month old little girl! She is my reason to slow down, to breathe deep, and to see the world as I have always imagined it. Take it in aura- its a magical journey! Congrats a thousand time! Girl, you have to put "sleep when baby sleeps" on your list. When those lovely hormones you are on drop and regulate, you are going to be T.I.R.E.D! Aura, this has me in tears! I remember all of these emotions in every corner of my heart. And to this day Stephan and I still occasionally disagree about this. I am the mother that stops what she is doing, no matter what it is, to be there for Charlie when she needs me or wants my attention for a while. Stephan is worried she'll become too dependent or spoiled, but as she's getting older... we're finding just the opposite is true. (I told him so!) It went against every nature or drive I had in my soul to do it any other way though - and looking back I wouldn't change a thing... no matter what got done or what hasn't. I have a proper congratulatory message to send you, but I have been waiting as to not overwhelm you, as I am sure you have a million already to read. Continue to soak these days up with every pore you have. They go by so quickly. Just as you are about to close the final chapters of her first days - in a few weeks we'll be closing the chapter of Stephan ever seeing Charlie as a baby and we're both kind of like deer in headlights wondering where all the time has gone. And as much as things only keep getting better, I still yearn for these early days with her to be able to repeat themselves. And as always, lovely lovely photos. Have a great week, Aura. You are so amazing. That is one lucky daughter. So gorgeous and so right. Enjoy your Baby E. My Baby E is 4 months old and I can't believe how fast it has gone. Scoop her up and hold her as much as possible. The lists will always be there, your tiny baby won't be tiny forever. I love the Neruda poem you used, it's one of my favorites. So perfect for this amazing time in your life. my mom once told me when i just had violet not to worry about tomorrow, for tomorrow will worry about itself. i continually to just "be in the moment"
I remember two years ago struggling with similar thoughts and feelings. Something as insignificant as not having a moment to make our bed would irritate me to the point of feeling I was a failure. A wise woman and mother wrote to me that the laundry, the dishes and the to-do's would always be there, but those moments with my child would not, and so i should enjoy them and make the most of them. Of course this advise should come with a touch of moderation, as laundry and dishes do need to be done, but when I have had to choose between a sweet moment with my child and another neat grocery list, the moment with my baby wins, and the grocery list ends up a lot sloppier than I would prefer, but my pantry somehow still ends up having what it needs. I think when having our babies we are growing up just as much as they are...growing up out of ourselves and into another. It is a process, and the feelings of failure and frustration are natural. They may not be true, they they are natural to feel. Just remember that they are not true. The biggest success of your life is fully loving those around you. This is so touching and eloquent..I can relate to you on so many levels that this post brought tears to my eyes. Thank you for sharing something so personal and heart-warming. You truly are a beautiful mama and an inspiration! That was beautiful, she is so beautiful! But honey rest, rest while you still can, especially while she's tiny and sleeps a lot. Rest before you have to go back to work. I wish I had more of your mentality sometimes to get everything done, but I don't...Now my son is 2.5 years old and super busy, and I'm pregnant with the second..Rest is few and far between, but I certainly am tired! Just rest while you can! Put that at the very top of your list! She is so beautiful. The letting go of the responsibilities part gets easier. Unfortunately it happens after that beginning phase starts to end. The first week for me I felt like I had to do everything. Making coffee for guests, getting dressed even though I cried in the shower just wanting to lay in bed with my daughter, picking up, folding laundry, doing all those things that now seem so silly. Now that she is 19 months old I have no problem letting go of chores, much to the dismay of my house :). But it feels good to just love and be. It never gets old. As a side note, I love the stripes you two are wearing this season. So pretty and fresh. love this post. you hit the nail on the head and have all the things figured out that we, as new moms, often realize when it's too late. Your writing is beautiful! I don't know what it is to be a mom but I do know that if I ever have that priviledge, I hope to see things as you have put so eloquently. For the past six months, I've been going through a phase where I wasn't sure if I ever wanted to have kids. Your blog posts on Elodie have changed that: I 100% want to have kids someday. What lovely pictures of the two of you! I love how you capture the light ;). I hope you have a great last few weeks at home! Thanks for sharing. you are so beautiful! and what a good momma you are and will grow into! im a FIRM believer you cannot spoil a newborn baby, its not possible. they need to be held and loved and feel secure. i love your stories!!! embrace every second bc it does go so fast! I agree with you 110%. Our little man just turned two months old last Sunday. I am also a list maker and want to get things done today, but I have realized that there is nothing more important then the love of a child and nothing can replace it. Enjoy the rest of your time off with her. I have been back to work for three weeks and I really, honestly, don't like it. I terribly miss both of my kiddos and want to be with them, but I know I get to come home to my wonderful family and it helps get through it. I love the pictures of the two of you. Both of you are beautiful. Aura, this is probably my favorite post that you have ever written! The photos are amazing and help tell your story so beautifully(did you take them with a tripod and remote? or did your husband take them?). Enjoy every moment with her, they go by so fast! Also, Im curious, Is her name pronounced like Melodie without the M? thought of you this morning when pandora played "be here now" by mason jennings. Lists can wait, your time with her being so young and so precious will not wait so you are right to ignore the pull of the everyday and get swept away with spending time with your adorable daughter. Aura Joon- This is such an honest and beautiful post, so refreshing and touching. You and Elodie are both so gorgeous! I'm so glad I found your blog. My Co-Workers and I love your Blog and get excited when you do a new post! you are so cute and love your words and pictures!!!! aura ... i just adore your heart and the honesty and beauty you share. keep on being you and enjoying these moments with miss precious. geez...she is just the cutest. Good for you lady! These are beautiful pictures of the two of you. These posts are so inspiring and these photos are so beautiful! I love the images! Beautiful words! And you look like you didn't have a baby at all. Gosh, I'm jealous! Did I mention I'm 33 weeks 4 days pregnant? I was thin like you to begin with but I have gained 28lbs so far. I wish to look as fabulous as you 3 weeks after I have my own little one! I'm not sure how everything works in the States, but it makes me a bit sad for you that you'll have to leaver her so soon. Even getting a year here doesn't seem like enough! This post is wonderful and honest. I hope you have a wonderful weekend and enjoy the next three amazing weeks with your little one. Just lay with her and enjoy her. Stay in the moment. I think this is your best post yet. You have it right on the money. I am not as organized as you are (with three kids couldn't possibly be, but it's also my nature), but I still feel the overwhelming sense of failure if my house is not clean (it never is) and I'm not creating enough. Now that I have two children plus work 40+ hours a week, I feel like I never get anything done. I'm okay with this because I know that this is not a permanent place for my life and when my girls are older, I will have more time to get my "to-do" list done. I'd rather enjoy them now when they are young and not worry so much about a sink full of dirty dishes or a dirty floor. Just an aside, Elodie is such a precious little thing! I love the new pictures you posted! Just as the to-do's will always be there, our babies will too, maybe not as tiny newborns but there to love just the same. I wish I would have been a little more relaxed with myself when I had my first two, I was so tightly wound and wanting everything to be perfect but at the same time knowing this perfection I was reaching for was never going to be reached and not as important and as my two boys. When I had my third I finally relaxed. Enjoy your darling girl, motherhood is amazing and I hope these days go extra slow for you. She is a real doll! I stumbled across your blog from another and I must say your blog is a beautiful read and beautiful to look at. Congrats on the new journey of motherhood, where everything she does will melt your heart. ***I also love your commitment to no advertising on your site. My baby is 2 months old and the past 8 weeks have been nothing short of intoxicating. I like clean and order and fresh around me, too. But the best advice I have been given is, no matter what, enjoy your baby. As soon as his little wake-up cries interrupted my dish-washing and it started frustrating me, I knew I had it backwards. Hold her, stare at her, memorize her. It's impossible to spoil her, but she needs you to try. :) Hope that helps set you free from your lists and worry. These are such simple days of meeting needs and giving love - revel in them. (Looks like you're doing just that). What a good mam you are...in just three weeks! I am a master list-maker. I stay at home with my kids who are two and three years old. Sometimes my list for the day reads "do laundry, play". Enjoy it, soak it up, give yourself permission to play all day if you need to. Enjoy because time marches on and raising children becomes more difficult than naps and feeedings! This was beautiful. Thank you for the inspiration! Nothing has ever made me feel more unsure of myself and my decisions than motherhood. I've come to understand this to be a good thing in that it means I am parenting with thought. Oh Aura. I love reading your posts and look forward to the beautiful photos of you all. You sound a lot like I was before I had my sons. I had lists of lists, everything had to be done, done, done. When Philip was born (now 22!) my whole world changed and I realized he was at the top of my list. There were some days when I accomplished many chores and others when it was 4:30 in the afternoon and I hadn't even brushed my teeth yet! Cling to these first few weeks and every moment you have with her. Nap when you are tired. Clean when you need to. Treasure your wonderful miracle! there, you have just received the best advice you'll ever get. you will long with a heavy heart that you didn't. :) hold her, stare at her, watch her grow. Enjoy your summer of love, with your tiny baby. no matter what you do, don't beat yourself up. i still guilt myself about not spending enough time with my babies and they're 9,7 and 5! but guilt isn't good for anyone. stay positive. and just do your best. How do you like your baby bedding from Rickshaw? I am expecting my third baby and was wanting to go in that direction. Thank you for reminding me that I'm not alone. Those seeds of doubt and endless lists don't just reside in my mind and my mind alone. And for reminding me to let go and enjoy. You are so very inspiring. To do lists do become history when a little one is in your arms. A few years later I still make them - but don't cross off the items on them as quickly (if ever) but I am OK with that. There is enough on our plates, as moms, and as long as there is love and food in the house (it may not even get cooked - so it will be sandwiches for dinner ;) everyone will be great. I read you line about 3 more weeks - is that when you go back to work? If so that is insane (in canada we get a 1 year mat leave (although I never took any because I'm self employed) still, that is hard to go back after 6 weeks. your words and pictures tug so hard at my heart strings!!! DO sleep when she sleeps, the housework, chores, projects will be there just waiting for you! We can't get the time back so spend it with her in your arms, starring at her while she sleeps...you will never regret it. This post is beyond gorgeous... That Pablo Neruda poem is among my very favorites-I had it lined up to read at my wedding but at the last minute decided to write my own poem. I happened to see your comment on Mandy's blog re: losing baby fat, and, while I know what it's like to be self-critical, as an objective party, I must say that you have never looked more gorgeous than you do in these photos. Really, you look so romantic and womanly. Some curve is just stunning on you. wow, what a gorgeous post. These shots are truly beautiful! These photos brought me to tears! I forgot whats its like already to hold a tiny new born. You are so Beautiful! Your daughter is precious gift from God! God Bless you! I'm definantly a follower, and I love your home and all your love decor! If you have a chance peek into my blog.